Ufone introduces Daily Pakistan Offer. The Ufone Daily Pakistan Offer is here, with this offer you can get U-U 100 Minutes 10 MB internet On Rs.18 + tax. 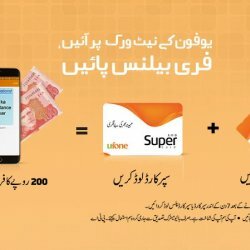 Ufone Daily Pakistan Offer is a Ufone bundle pack. It is a 1 Day offer contain U-U 100 Minutes 10 MB internet and which will be valid for 1 Day. The price of this offer is Rs. 18 + tax. If you are looking for Ufone Daily Pakistan Offer then you can find them here. You can also find the public and customer opinions and reviews about this Ufone Daily Pakistan Offer Bundle here.